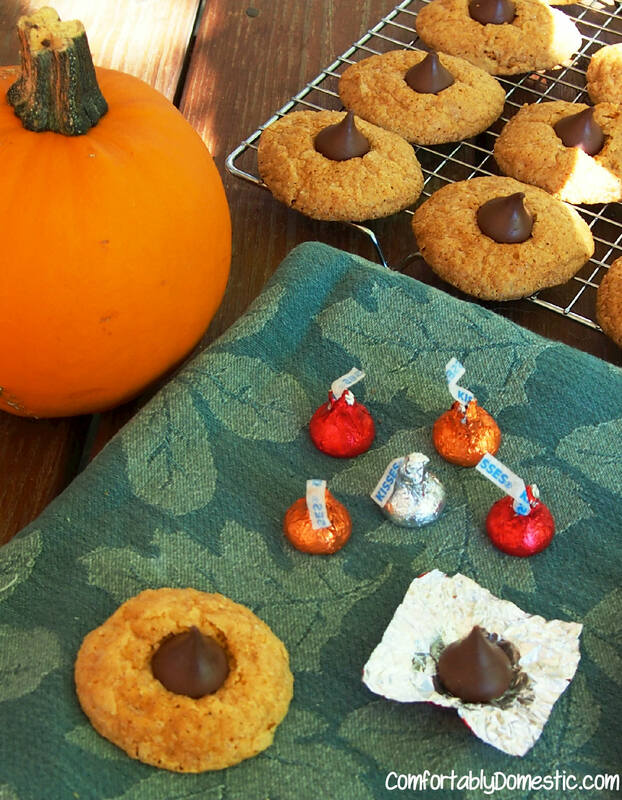 Pumpkin kiss cookies are the classic holiday favorite cookie, with a kick! Deliciously soft and spicy pumpkin cookies with a fat kiss of chocolate in the center. Today, I’m back with a new Fall Favorite around the Comfortably Domestic house–Pumpkin Kiss Cookies! I first thought to make Pumpkin Kiss Cookies while lamenting the lack of peanut butter blossoms in my life. Call it a few brief moments of peanut-allergy-pity. A few minutes of wallowing later, and I decided to hang up my Pity Pants, and put on my Big Girl Apron instead. I thought, “why not make a different cookie and plop a Hershey’s Kiss in the middle?” I didn’t want to simply substitute SunButter for the peanut butter, as I do with most things, because I don’t ever want my peanut-allergic boys to mistake my safe cookies with not-safe cookies somewhere else. A baking dilemma, to be sure. So if not SunButter, than what? Being that I love, love, LOVE warm spices with chocolate, I had a hunch that a pumpkin spice cookie with a kiss of chocolate would be absolutely lovely. It was a very good hunch. Pumpkin Spice Cookies combine a light, spiced pumpkin cookie with a big, fat kiss of chocolate, smack in the center. What’s better than a deliciously soft cookie with a chocolate center? Not much. Besides, with all those vegetables hidden inside, the Sons get a few extra vitamins in their diets without even knowing it! Score one for mom! 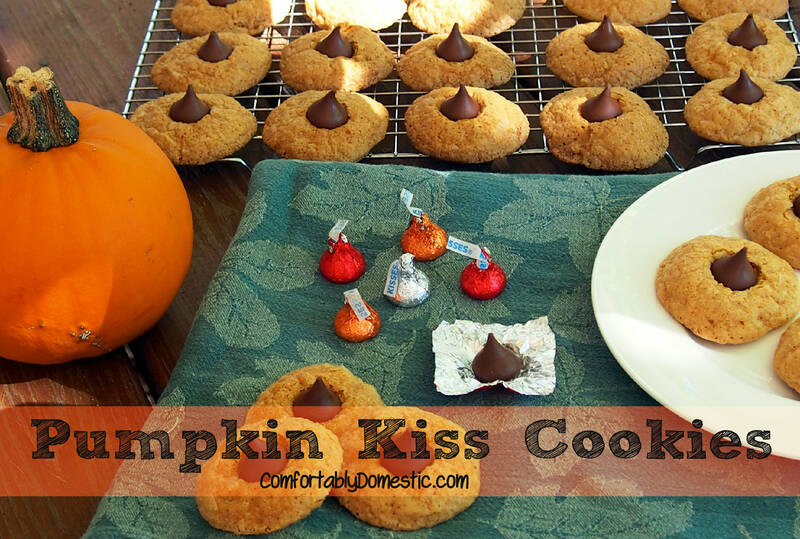 Pumpkin kiss cookies for everyone! Deliciously soft and spicy pumpkin cookies with a big, fat kiss of chocolate in the center. 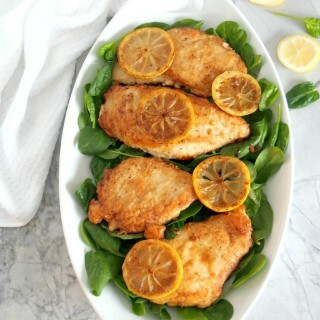 Preheat the oven to 350 degrees F. Line several baking sheets with a silicone baking mat or parchment paper. 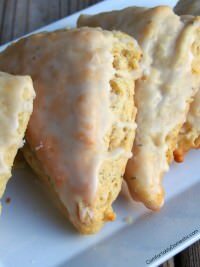 Cream the softened fats together with the sugar until it becomes light and fluffy, expands slightly in volume. Beat the egg, egg yolk, and vanilla to combine. With the mixer running, drizzle the egg mixture into the creamed mixture, beating until incorporated. Whisk the flour, baking soda, salt, and spices together to combine. Alternately incorporate the flour mixture and the pumpkin puree into the dough until well blended. Scoop the dough onto the prepared baking sheets in rounded tablespoonfuls, spaced 2 inches apart. Bake for 15 to 18 minutes, or until edges are beginning to brown and centers are mostly set. 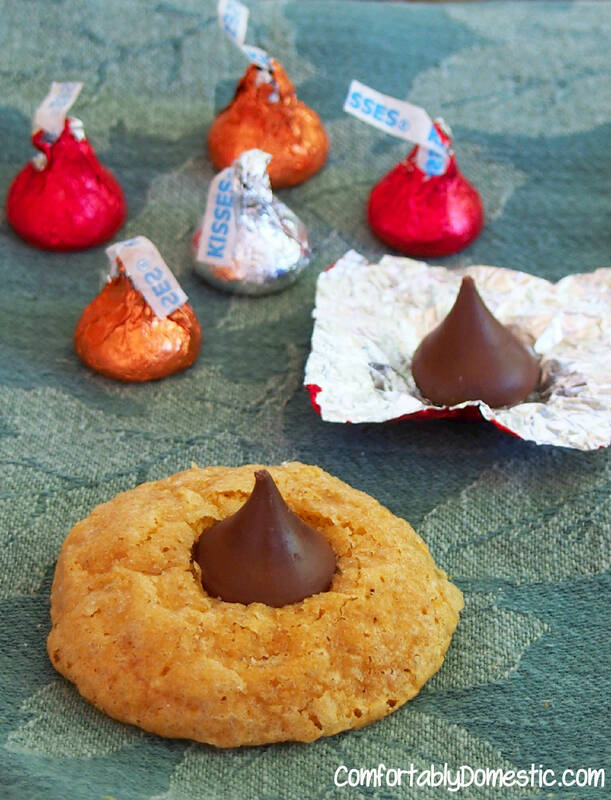 Remove the cookies from the oven, and immediately depress an unwrapped Hershey’s Kiss in the center of each cookie. Let cookies stand on the baking sheets for 2 minutes before transferring them to a wire rack to cool completely. Cookies may be stored in an airtight container at room temperature for up to a week. Enjoy the rest of Pumpkin Week, Friends! Be sure to stop by again on Saturday, because I’ll be back to work a different squash into a savory dish that my boys gobble up with wild abandon. those look and sound awesome. I never use vegetable shortening do you think I could use all butter? or half butter and half coconut oil?